Because I was so concerned making my recycled bridesmaids dress look like something other than a bridesmaids dress, I was almost late to Dan and Karen's wedding on Day 251. When I pulled into the Decatur Square, I found the first open spot I could find, and quickly parked my car. The sign in front of the space read, "15 Minute Parking." My thinking was that I'd run into the wedding, then run out and move my car before the reception. If I know Dan, his wedding ceremony wasn't lasting much longer than 15 minutes. As I started to leave, I told my friends where I was going and they all told me to stop. "Where are you going to move your car?," they asked. I didn't know, but certainly I couldn't leave it there. "Don't move it," they all said, explaining that any ticket I might get would be cheaper than paying to park. That reasoning seemed logical at the time, and I really didn’t want to leave the party to move my car, so I did as they suggested. When I went back the next day to pick up my car, I imagined it might be covered in tickets, maybe even a boot, hell, it could’ve been towed for all I knew! But when Philip took a right into the Decatur loop right past the courthouse, I was delighted to see that my car was still there, ticket-free. This story has nothing to do with things I've never done before. As someone who abhors paying for parking, though, I was elated that my 15 minute parking space yielded more than 16 hours of free parking. The city of Decatur rules. After Philip and I grabbed lunch at the Brick Store, I returned to my house to do more lounging, because other than eating, that's all I really felt like doing. I was horizontal for most of the day, not thinking of doing something I’d never done before until it was almost too late. I Googled, “stuff to do when you’re bored,” hoping that I could find something to do that I'd never done before. Sure enough, I found something. Thank you, Internet! 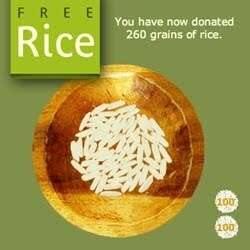 Day 252’s thing I’ve never done before was to contribute several pounds of rice to those in need via www.FreeRice.com. FreeRice.com is a non-profit website that hosts word games anyone can play. For every correct answer, the organization donates 10 grains of rice through the World Food Programme to help end hunger. Educational, philanthropic, and easy. The ultimate blog activity trifecta. Playing was easy, but the words were hard. Or maybe I'm just an idiot. I played for a while, taking frequent breaks to watch Keeping up with the Kardashians, likely offsetting any educational benefit I could've gained. But I've visited this website often since that day and continue learning words I'll never be able to use in conversation. And I've donated more than ten pounds of rice to those who really need it.